She's Sew Crafty: Bambi Who??? 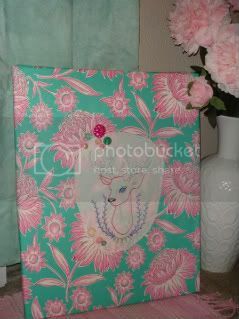 So, this has got to be one of my favorite things I've ever made.. if not my favorite! I really adore this.. I mean absolutely completely adore it! 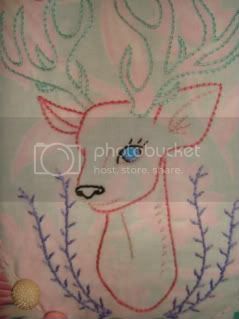 I used the Forest Friends pattern from Sublime stitching to embroider the deer. The fabric I got from Sewmamasew. 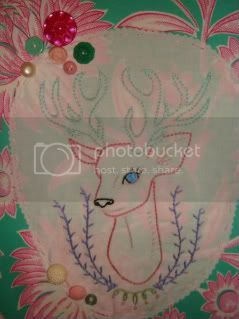 I covered the canvas with the fabric and then appliqued the embroidered deer on to the entire thing. I then adorned it with some vintage buttons I got from my Grandma's button stash that she gave me. I really think it turned out beautifully. I'm going to mount it in my living room near my desk. I really hope ya'll enjoy it as much as I do! This is so adorable. Great job as always. I have see a lot of your work on craftster... I too love sublime stitching patterns. Your blog is cute.